Whether you use digital or paper or a combination of both, organise your calendar so that it becomes a helpful assistant + not a harsh task master. Last week we talked about how getting things done isn’t just doing a bunch of tasks. It’s how we manage our lives + take care for ourselves. We’re taking a step back to look at how we set ourselves up to get things done. This week we’re looking at events. I’m sharing some tips on how to organise your calendar so that it becomes a helpful assistant + not a harsh task master. Events are time or people based activities. They are activities that have to be done by or on a certain date such as birthdays + celebrations, holidays, bills, social events + appointments. How we organise our schedule sets the tone for the rest of our life, and that of our family or work. If our schedule is super packed we can be sure that we won’t feel rested or in the moment with those we love. We won’t have time for personal projects or to take care of our health. The first thing to note is that you don’t have to schedule every event that comes into your life. And you don’t always have to commit straight away. I often say, “I will talk it over with the family + get back to you.” It’s not a delay tactic, it helps keep me from over scheduling. I can easily be swept up in the moment or moved by compassion without thinking things through. And that’s not fair to others, especially my family. Remember getting things done is about taking care of you + those you love. Once we have decided what we will commit to, we need a place to record our events, and at times, share these events with others. You don’t need to keep everything in the one calendar. Maybe a combination of digital + paper would work best for you. You may keep your family schedule in your digital calendar + your business in a paper planner. As long it’s a place that you will use it really doesn’t matter what you choose. The right choice is one that works for you + your family. I record bills, birthdays + celebrations, social events, appointments + our homeschooling lesson plans in Calendar. I think of these things as the nuts + bolts of our daily lives. As a work-at-home-scholling-mum, I have a bunch of different pieces to work together effectively. The main reason I use a digital Calendar is that it syncs automatically across our Mac computers + devices. We all know what is happening and when. I like that I can see a month, week + day view without having to transfer anything to another page and easily search for items. I also log my design time for clients in there as it’s easy to see what was done + when. Best of all I love that I don’t have to remember for anyone else or remind them! The two things that won me over when I switched to digital was the ability to set reminders + reoccurring events. They are two features that have made managing events so much easier. For work it has been a life saver, literally. Sending work to printers, newspapers at specific times it easy with reminders. And it’s been great for paying bills. I can see what’s coming up + easily share that at our weekly family meetings. Instead of having to remember + physically organise all these things I can to use that mental space for more creativity! I have a stack of old diaries from before I “went digital”. As a planner + organiser at heart I remember how much I enjoyed filling out a new one each year with addresses, phone numbers, birthdays + upcoming events. Even though they aren’t decorated with beautiful washi or stickers available today, as a memory keeper I still enjoy looking back over them. With the growth in planners last past year or so I often think it would be so much fun to switch back. I realise that would be adding more work just for the novelty. And I know I wouldn’t like everyone poking their head in my planner or writing in there. So instead I get creative in my planners for other things. Even though the nuts + bolts of our daily lives are in our digital calendar + I still like to use a paper calendar for planning. Plans change a lot + I’d rather cross something out that be rearranging a digital calendar. At the end of the day whether you choose digital or paper, or a combination of the two for recording your events, paper + digital calendars they do the same thing. They let us know what needs to happen + when, while helping us from over scheduling our lives. At the end of the day, being a planner lover + organiser isn’t about cramming as much as you can into that calendar. Find a way that works with you, like a great assistant, not an overbearing taskmaster. And remember to schedule some time for fun + rest! This series on Getting Things Done covers five key categories : events, goals, notes, projects + stuff. No matter how we go about getting things done, there are three things we do with everything that comes in, we “ collect # reflect > connect. These three simple steps are what I call FUSE:life because it’s what we are doing when we blend together different pieces of our life into something meaningful, and ideally, a life we love. 1. ” Collect : write down all the kinds of events you need to keep track of. List out the different kinds of activities that you will include on your calendar. eg: birthdays, appointments, bills, holidays and so on. 2. # Reflect : next we decide how to best organise our calendar by answering the following questions. Do you prefer a paper or digital calendar? What kinds of events would be helpful to share with other family members or work colleagues? Mark these on your list. Which events would it be helpful to set reminders for or as reoccurring events? Mark these on your list also. You also may like to decide now how you want to handle future incoming events. Will you commit straight away or set yourself a time frame for considering your commitment? This can be extremely helpful when the event affects a number of people or requires a large commitment of time. # Tip : We will take a look at our daily routine + todo lists in the weeks ahead. 3. > Connect : this is where we get to dive in + set up a system, a plan that works uniquely for you. Set up your Calendar with separate colours for different categories. eg: accounts in orange, birthdays in pink, shared home events in blue and so on. Share the calendars you marked earlier with other family members or work colleagues. As you start to use your digital calendar mark events with reminders + as reoccurring as required. 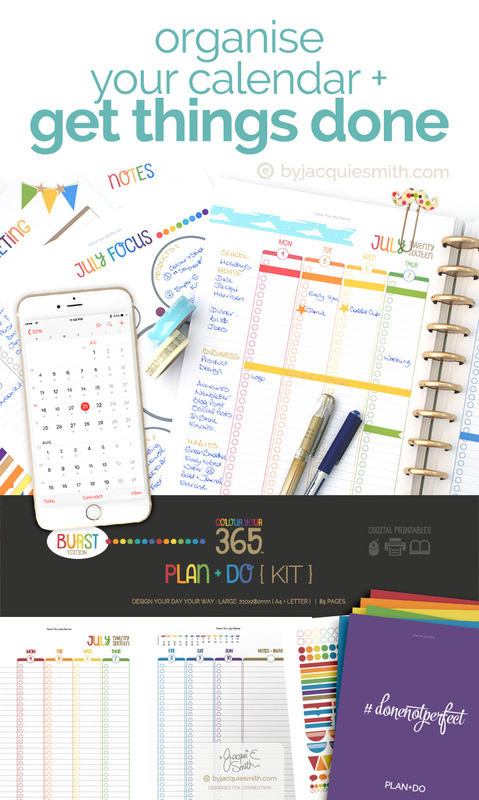 Pop over and shop the Colour Your 365 planner printables to set up your own gorgeous planner. 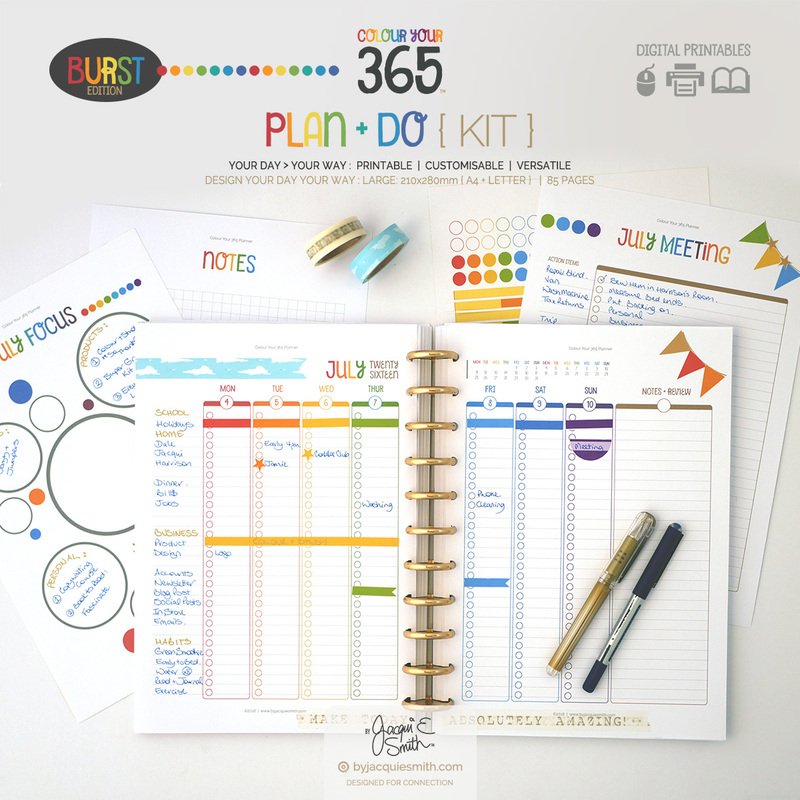 The Plan + Do Kit was specifically designed to help blend various responsibilities for family + business. It’s a list lovers dream with built in check circles for marking of events as they are done.